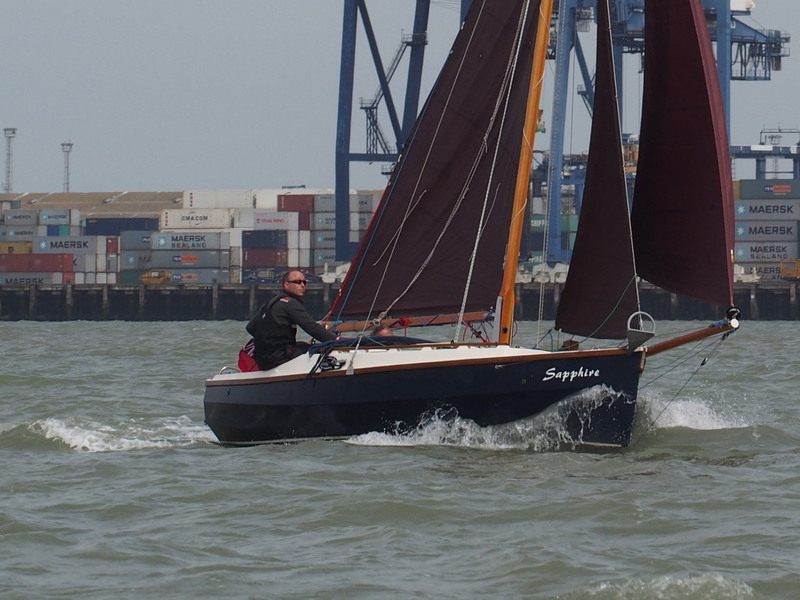 Minnie is ashore in Cambridge now after a good and testing few days last week. 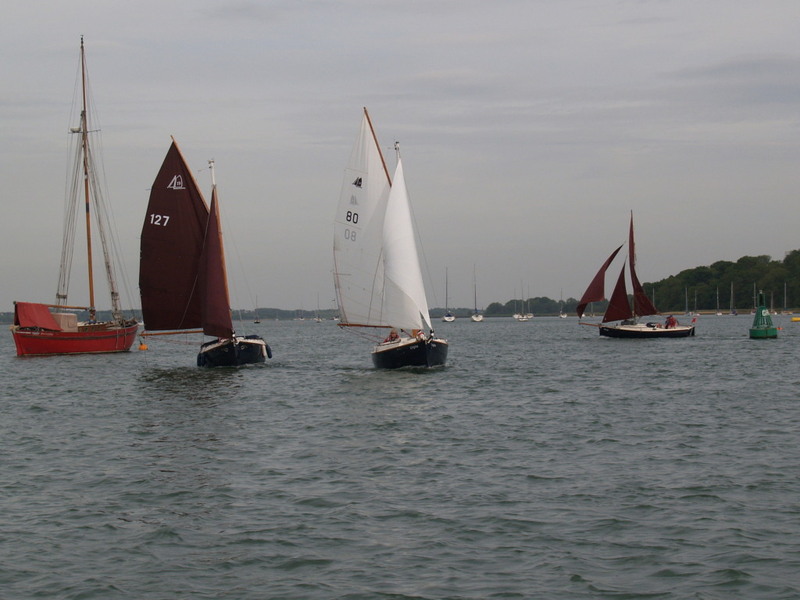 With a crew of three ,the objective was to sail from Suffolk Yacht Harbour in the Orwell to Wells-next-the-sea. 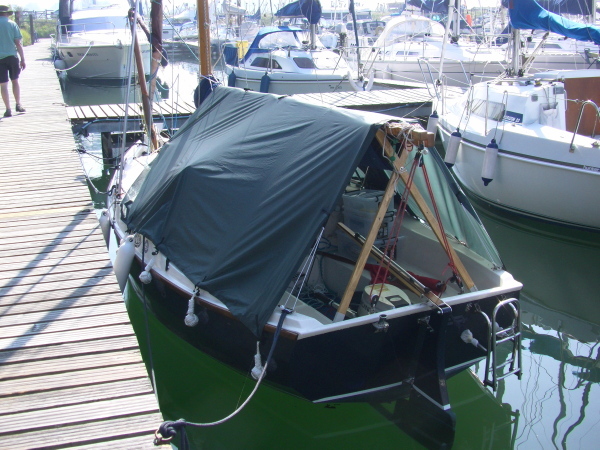 Suffolk Yacht Harbour , showing the Mk 1 tent open. 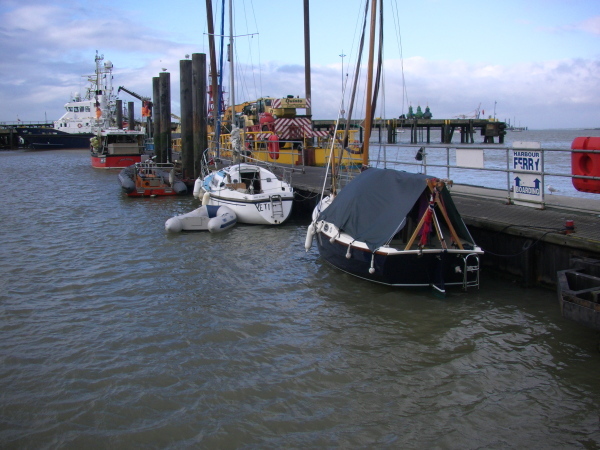 Suffolk Yacht Harbour , showing the Mk 1 tent closed. Subsequently holes pecked in it in Whitby . Day 1 We had a S F5/6 with F7 later. Right direction , wrong strength. We ventured out to Languard Point and decided to spend the night in Harwich. No charge from October to April. The F7 later turned out to be an F8. Tucked up in Harwich Harbour as the gale blew through. Day 2 Back out to Languard forecast S. F5/6 falling later. 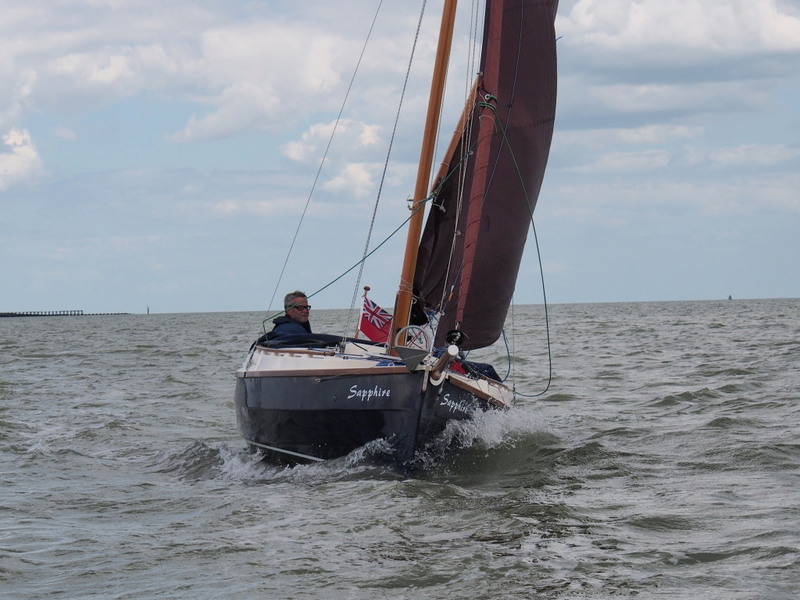 Very choppy at the headland , and we set off with staysail only , making 4kts sog. against a 1.5kt tide. 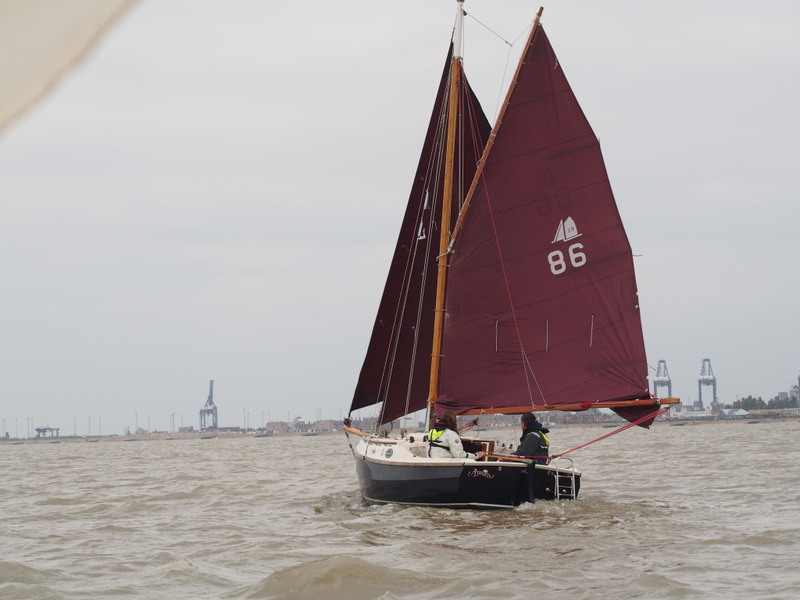 Things eased gradually during the day , and after using almost every sail combination we arrived in Lowestoft , Royal Norfolk and Suffolk Yacht Club 8 hours later. Good point…the Dennis/Russell inspired lazy jacks worked faultlessly. Day 3/4 Lowestoft to Wells…57miles. With a tricky entrance , recommended HW plus or minus 2hours , we did not want to miss the tide , so allowed 19 hours. Starting with light S winds we sailed goose winged with the genoa poled out. We rigged a “lash up” preventer using the kicking strap rig , anchored to the mast stay turnbuckle…..this worked remarkably well , although I was a bit concerned over the short lever arms , and consequential high loads. Winds picked up during the night ending at F6 and backed SE , so we had the wind on our tail for the whole trip. The result was we arrived 5 hours early. 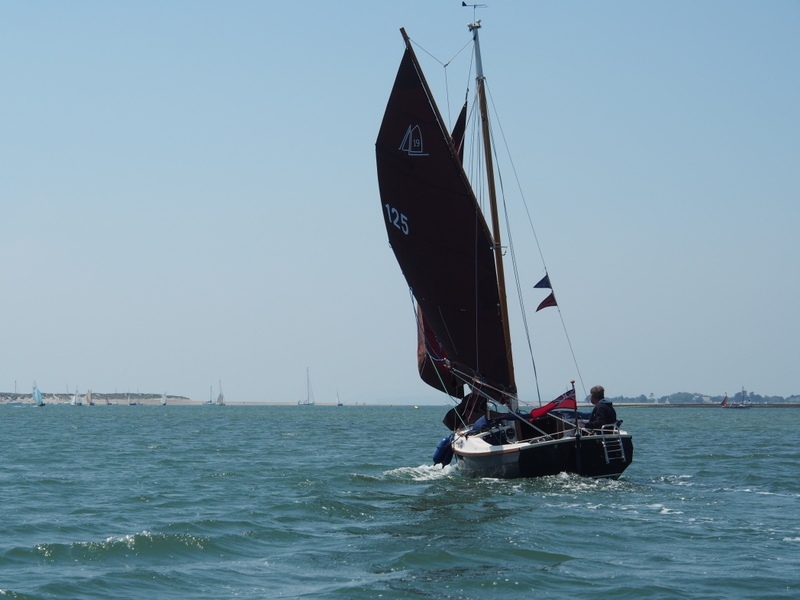 We then checked how Minnie liked being hove to…..the answer is quite well…and with a fully reefed main and staysail we jogged back and forth at about 1kt whilst the tide moved us along from Blakeney to Wells. We crossed the bar 3 hours before HW and slowly motored in with the tide ,mooring on the pontoons by the HM office . 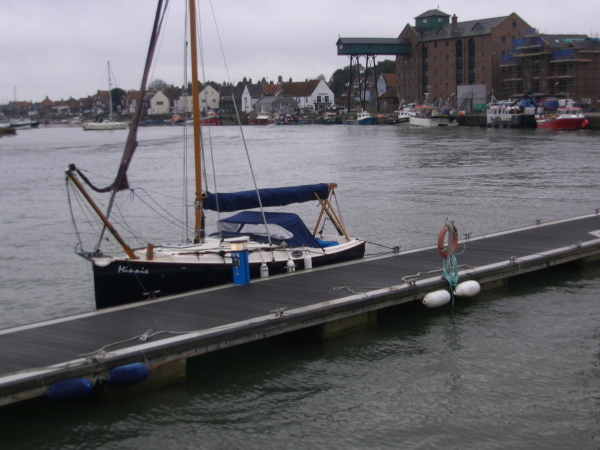 On the pontoon in Wells next the sea. Looking out to the entrance of wells harbour…about 2 miles of ever shifting sand banks. 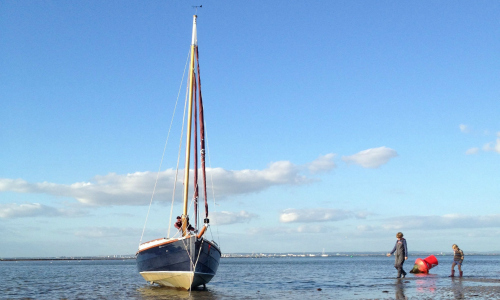 On Monday 19th May , launched at Wells Next The Sea . HM team very helpful , dropping the boat down the slip with their tractor . Moored overnight on the pontoon and shuttled the car / trailer back to Cambridge. Weaved out of Wells an hour before HW…not the drink , it’s just a very tortuous entrance , and set a direct course for the Humber Estuary. For the first couple of hours the tide was against and we struggled to get far enough from shore to escape the sea breeze. Finally with the tide turning we made decent progress passing through the Docking channel and then heading for Outer Sand East Cardinal. We had decided to skip Grimsby and continue north. By now it was dark , with a fair number of ships about together with the Xmas tree lights on the gas rigs and activity around the wind farms. 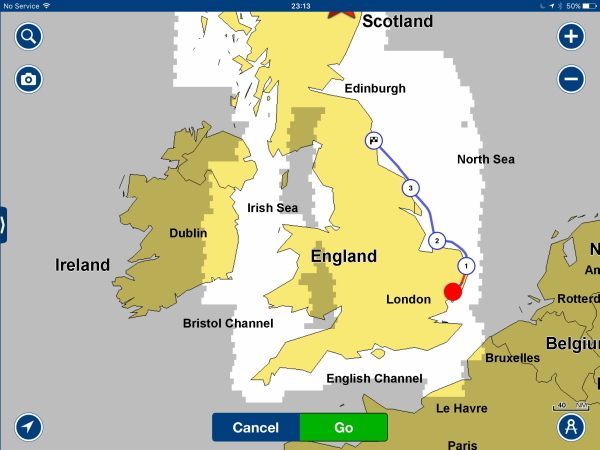 The chart plotter worked well and the AIS overlay was reassuring , allowing monitoring of shipping . 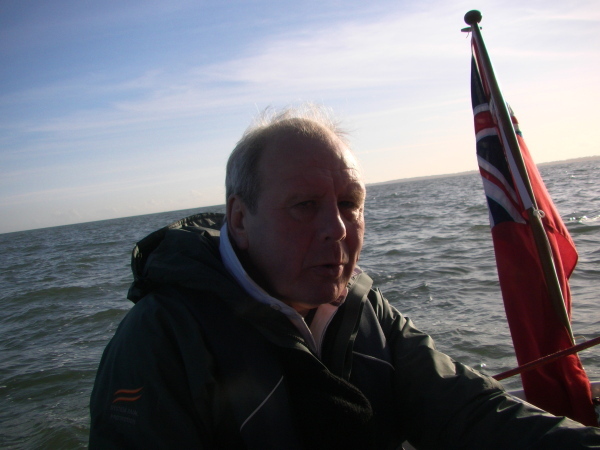 The wind died down during the night and we motored towards Bridlington , arriving at 08.00. The Port staff were very helpful , sorting out a berth. It was quite spooky to find ourselves encased in soft mud at low water , along with 150 other boats. I’d been a bit worried about our VHF….and the port staff found a radio specialist who checked the aerial function , OK. 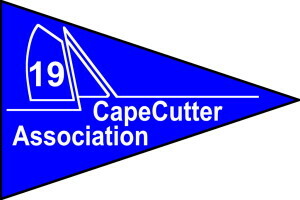 The duty member on at The Royal Yorkshire Sailing club was friendly and provided lots of info. on sailing further north. The forecast was not great , but we pressed on in the morning heading for Whitby. Expecting problems rounding Flamborough Head with a NW wind , we put a reef in . The wind was forecast to veer NW , but stuck around NNW and we had a very uncomfortable time under engine the whole way . The sea state was such that I had concern over Whitby entrance . Port Control Whitby were very good , checking the entrance swell and as we approached , confirmed that we should be ok. We entered at dusk , and moored on the waiting pontoon before the bridge. Port staff came to the pontoon , explained the port procedures and provided a ” key” for the showers at the marina. Two hours wait for the bridge were spent in the pub with fish and chips. 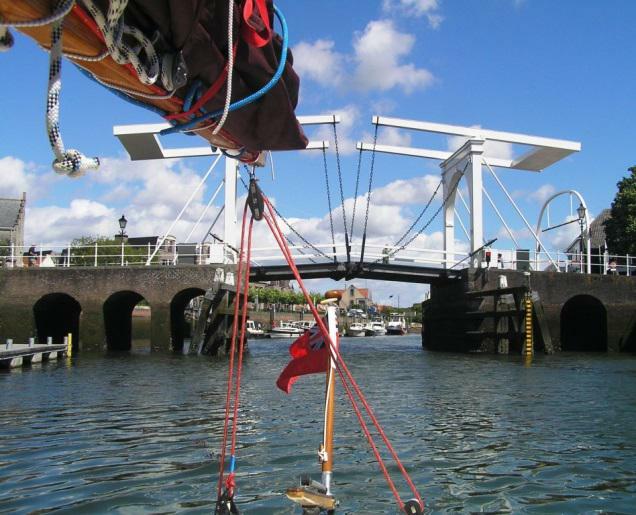 Radioing the bridge ….told to do this 20mins before scheduled time…got no response , so back to Port Control. Bridge opened and we found the visitor berth in the marina. The last 5 hours had been carried out in torrential rain….so tent up and off to bed. Some leaks overnight , so a bit fed up in the morning. Looking at the forecast we decided to call it a day…..so back to Cambridge for tea. Further North will be for another day! 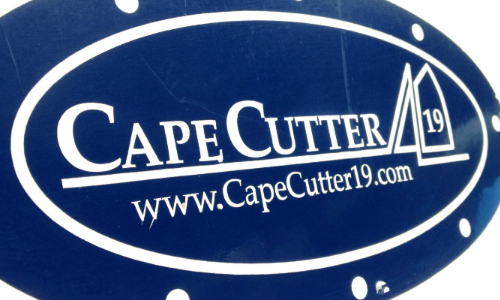 So… 120 miles in two legs…34 hours at sea…two on board. Learnings… Minnie is a tough little boat…tougher than we are anyway. AIS is a great when in congested areas with poor visibility. 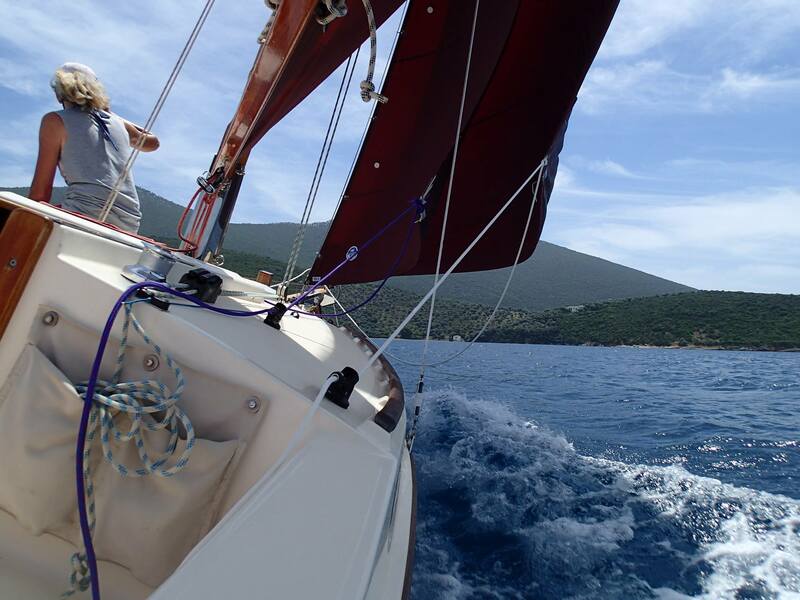 Once you sail overnight you need two crew who are happy to sail single handed…allowing rest/sleep. You can make good progress though. We carry a couple of plbs and a just purchased 2 man life raft.(unused!!). Sitting at home…Minnie at Whitby… I’m checking the weather and thinking about finding crew. 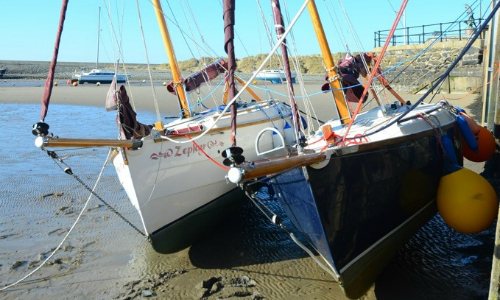 Last Tuesday we returned to Minnie , in Whitby Marina , after a couple of weeks of poor weather . Minnie was ” dry “..hooray! . 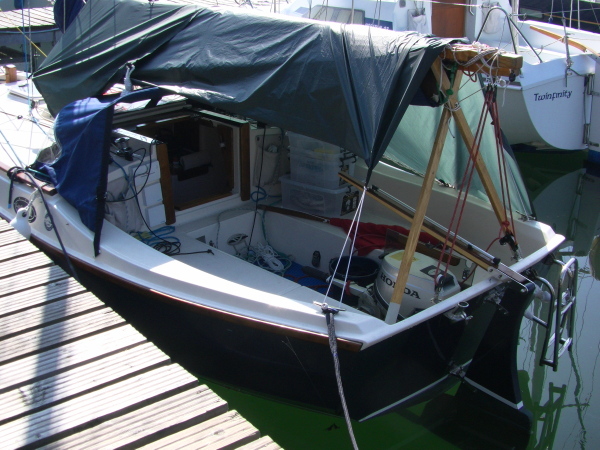 Paid the fees , minimum charge is for an 8 metre boat….no discount for a full week , so all in all a bit of a rip off at £21.50 per night. Leaving on Wednesday meant getting up at 03.30 to catch the last morning bridge lift at 04.30. Good sailing on a beam reach until about 11.00 , when the wind finally gave up and we resorted to the “iron topsail “. About 8 miles off Seaham we saw a whale….crossed our track and appeared to be shallow diving for fish. Not sure whether it was a Killer Whale or a Minke , but I reported what we saw to a whale spotting website. Arrived in the Tyne and berthed in Royal Keys Marina at 16.00….43 miles . Manned 24 hours and locking in / out available at all states of the tide. 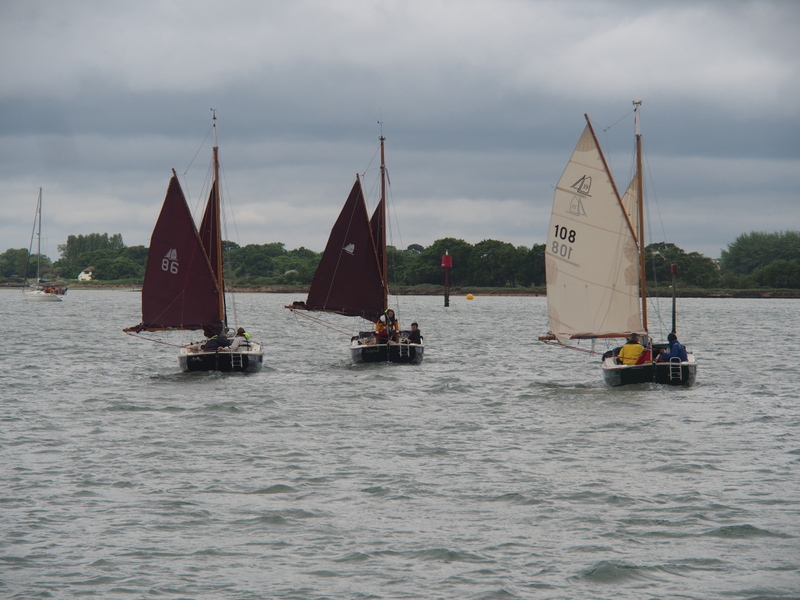 Thursday provided the best sailing since we left Harwich….F 3/4 Westerly all day. 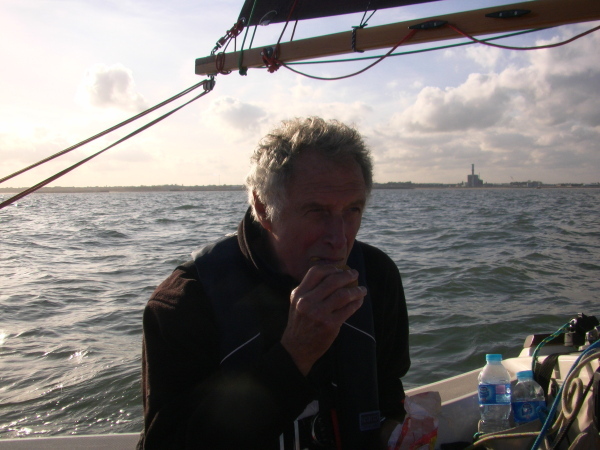 Topped up with fuel at the pontoon and left at 09.30 ….arriving in Amble at 16.00…. 27 miles. We managed to sneak through the Coquet Chanel just before high water , saving a couple of miles. 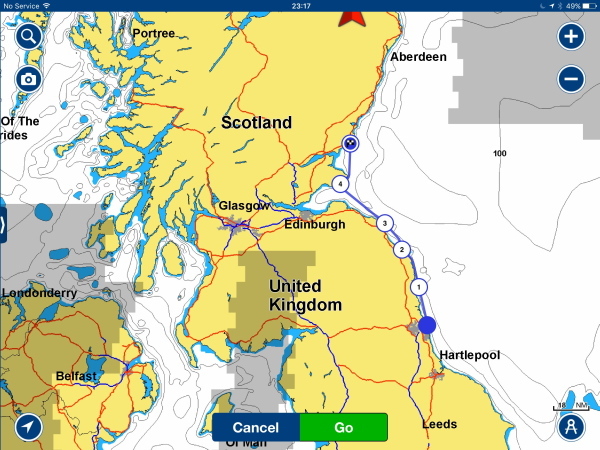 Minnie now tucked up in Amble , awaiting the next leg which will include the Farne Islands and Holy Island. 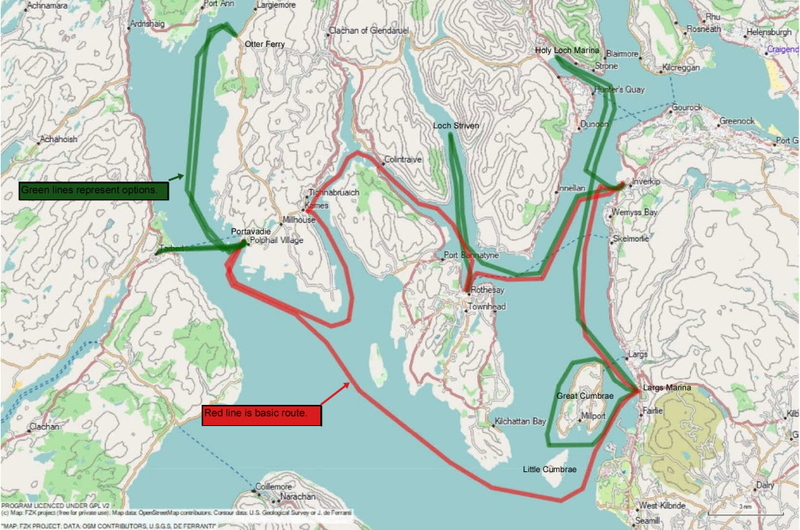 Any thoughts / local knowledge on sailing this area would be welcome, particularly anchorage sites and suitable dinghy landing points. Back to Amble , and on 11th July we set off for Holy Island. Before starting we inflated the dinghy and towed it for the next few legs . Using the two towing eyes on short lines worked well. About 10 miles north of Amble is The Ship Inn , Low Newton. Entry into a sheltered bay is straightforward , and it gave us a chance to practice our anchor routine as well as dinghy boarding. The bad news was the pub stopped serving food at 14.00….so no crab sandwiches for us…however the beer was good. 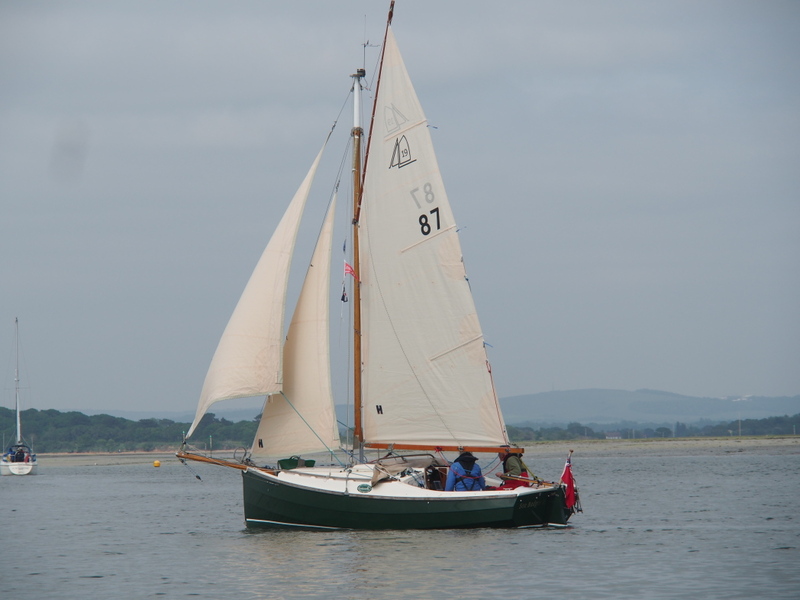 Carrying on to Holy Island , the wind dropped so we motored for a couple of hours arriving at 19.00 . On cue a brisk SE followed us in and a very turbulent ebb tide out. A bit spooked at the prospect of anchoring on a lee shore , we shuffled about and finally tossed the hook over , settling about 50 metres from the shore in the Heugh. The wind was F5 ish so we sat for a while to confirm the anchor was set. Finally happy we took the inflatable ashore….on the end of a line in case the wind increased further. A brisk walk into the village to find that food service stops at 20.00…..so a packet of crisps , a pint and back to the boat. The wind had reduced but we still used the line to pull ourselves on board. There was a wailing choir of seals across the water who kept singing into the night…..we probably saw 100 seals in the water and more on the beach. 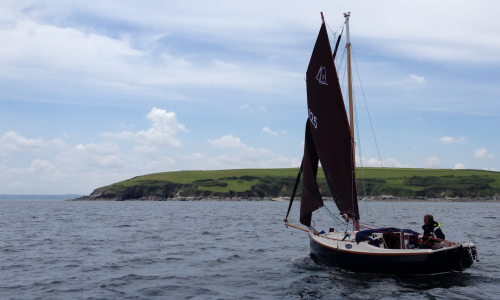 In the morning….first night at anchor in Minnie…off to Eyemouth. 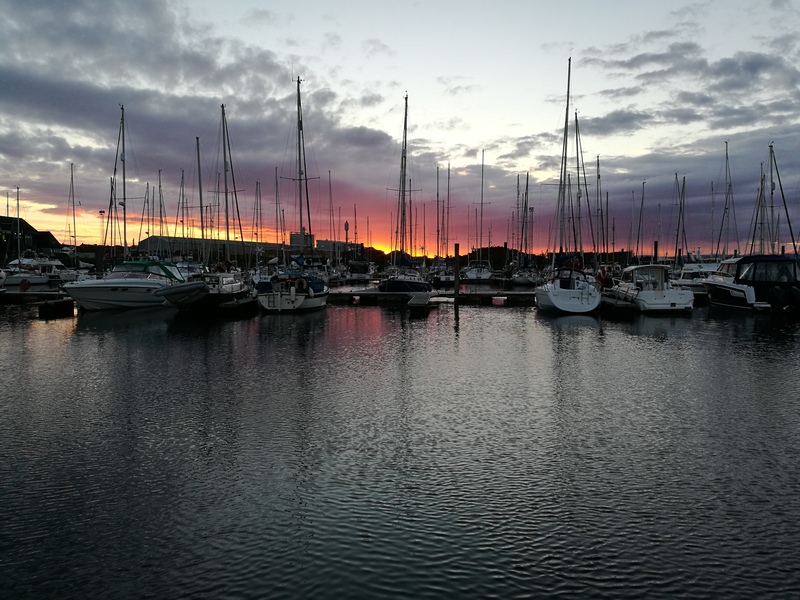 Amble is a great marina and a terrific spot for a couple of days sailing with plenty of advice from the marina staff, with the Farne Islands , the anchorage at Newton and Holy Island within 20 miles . It must be just a short trip from Kielder , and no midges. 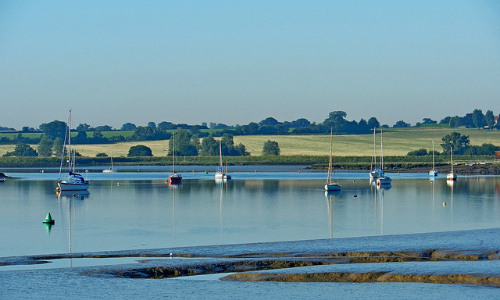 Suffolk Yacht Harbour to Amble, Nortumberland. The Heugh was flat calm on the morning of the 12th….seals still singing!! 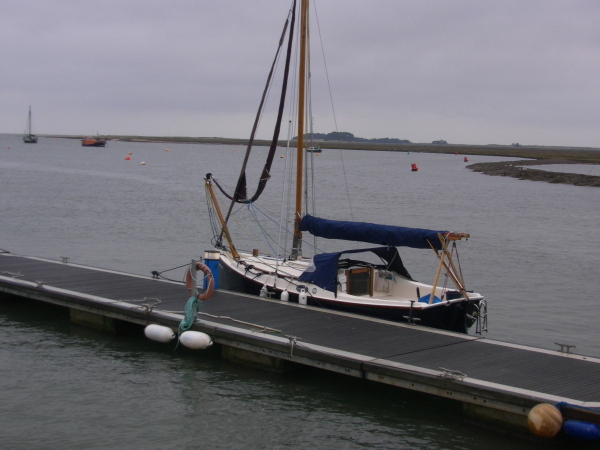 The two anchoring options we considered in Holy Island Harbour were the pool below the Heugh…near to St Cuthberts Island and the Ouse. 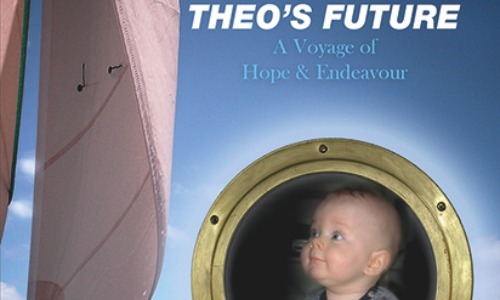 The Ouse was dried out by the time we arrived ……and we had been warned that the anchorage there was fouled….it looked the place for maximum shelter , but you would need thigh boots to wade ashore . Ouse by name and nature. Raising the anchor was straightforward and the “trip line ” we set was not required. No wind so we motored the 20 miles to Eyemouth , mooring up on the quay pontoon. The HM was very helpful and the showers welcome….and the pub served food. 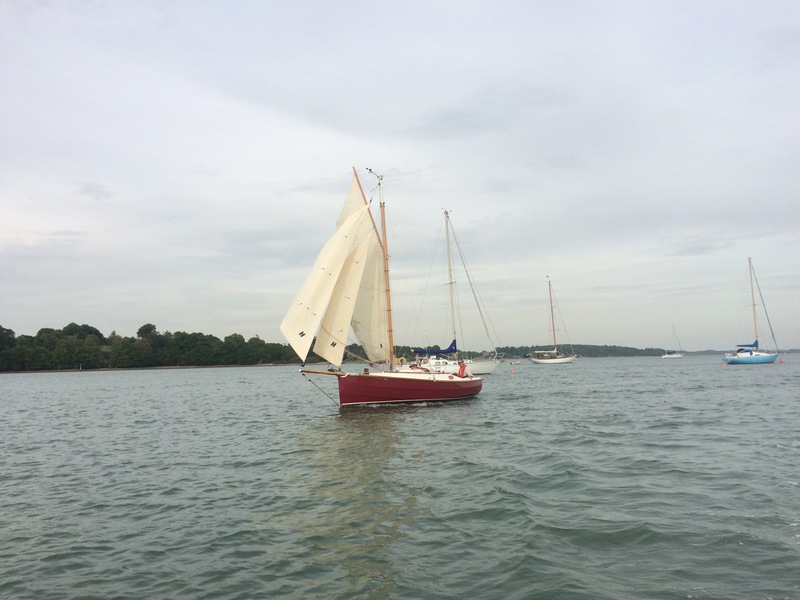 Next day motored out , Westerly F3/4 set reefed main and staysail. Rounded St Abbs Head and headed for Anstruther , or as neat as we could point. Busy day as we shook out the genoa , then full main ,then 1 reef , then 2 reefs , then wind dropped to zero at 16.00. 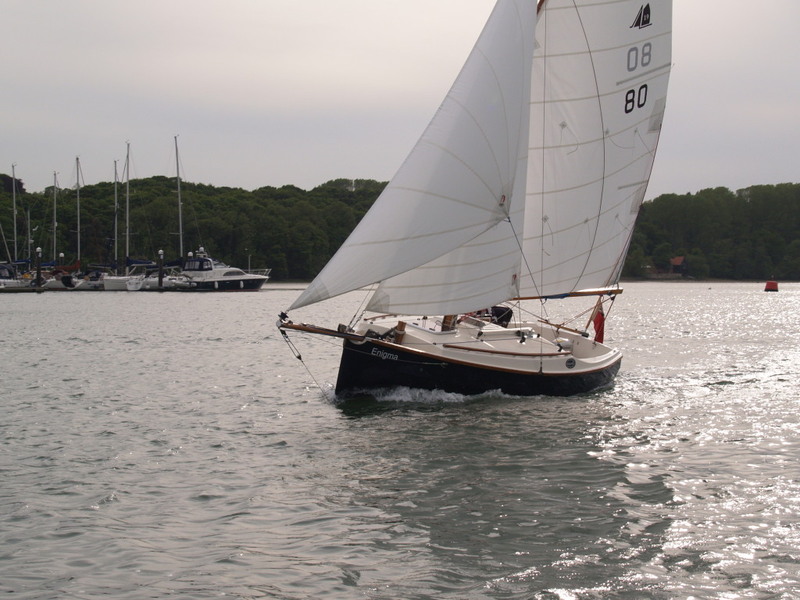 Started motoring and packed the sails away…..thank you lazyjacks…..just in time for the wind to veer NW and go F5/6. 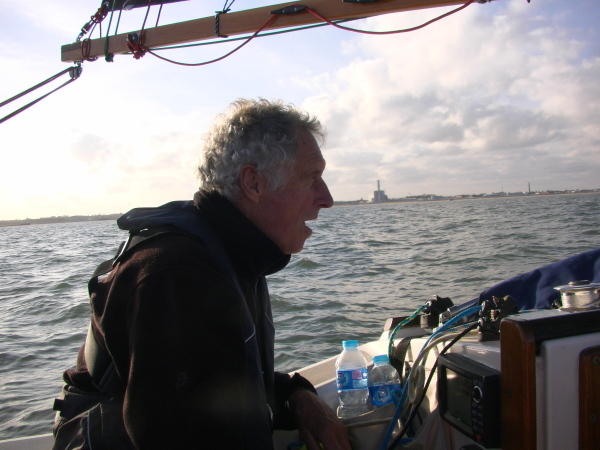 The tide meant we had to get into Anstruther pdq so we motored past the Isle of May….arriving at 18.45. 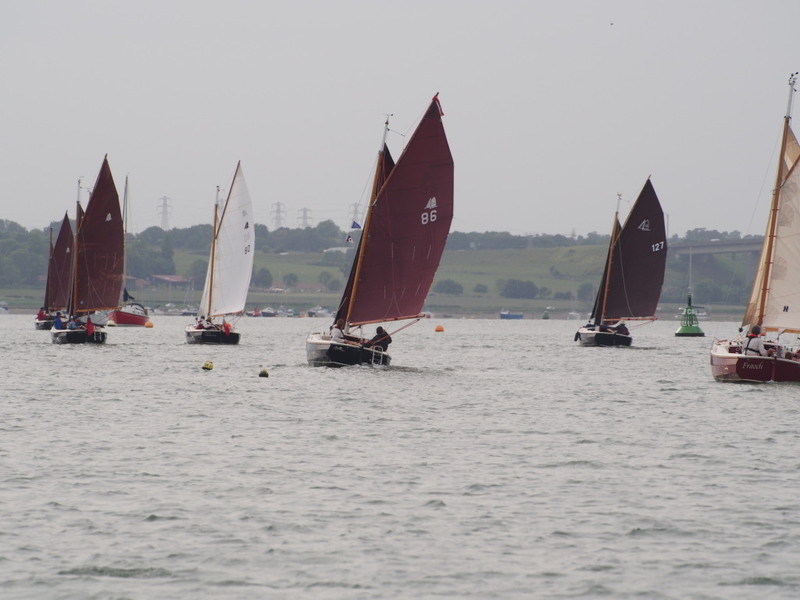 The marina comprises mud berths on pontoon….hardish mud so no fin keels. After mooring up we found we were locked in…requires a key , which is available during office hours ….on a Sunday….not really available. I had phoned on Sat and Sun morning but no reply. Managed to borrow a key , showers not really available , so off for a pint and an early night . Found the HM in the morning , he was quite helpful , just constrained by local authority working hours and not the tides. Leaving in the morning was a further stage in our education. Up at 06.00 we breakfasted and decided to move on to the harbour wall near the entrance…..so escaping the drying harbour. 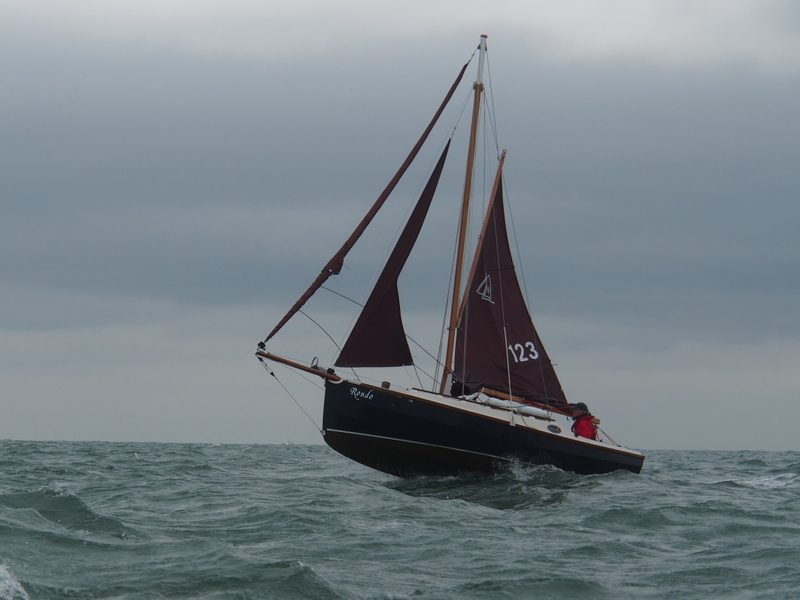 The HM arrived at 07.45 and thought we would be ok if we left by 09.00…so a quick wash and a cup of coffee and we cast off at 08.40…..immediately grounding…..despite heroic efforts by the crew who waded to position the kedge anchor we were stuck. 20 mins later we could walk ashore…..stroll into town….have a shower…..an early lunch and walk back to the boat. Carefully positioned the kedge anchor to guide us into the deepest part of the channel ( about 6 ft wide ) and waited. The tide came in fast….from the first water touching the boat to floating off less than 30 mins.. The walk into town had allowed time to look at a Fifie…..a two masted lug sail fishing boat from the late 19th century. 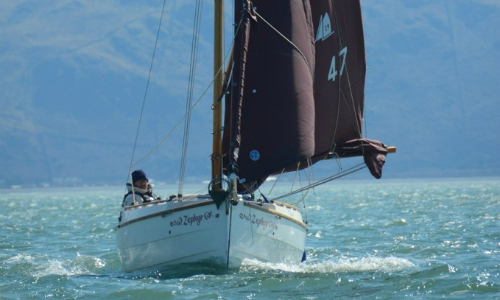 It was dry , against the wall with 4 men repairing / caulking the hull…..we saw a similar one in Arbroath and the local ship builder said the masts weigh several tons. So…tail between our legs we sneaked out of the harbour and set sail for Arbroath at 12.15 . Sailing for a couple of hours we passed Fife Ness with one reef then full main then motor sailing to keep the speed up , before finally motoring the last 2.5 hours. The issue at Arbroath is that the marina gates shut at half tide , the alternative being a drying out harbour filled with fishing / potting boats. Whilst motoring we were accompanied for 30 mins by a large dolphin….solitary and only surfacing every 3 or 4 minutes….not the usual dolphin exuberance . Arriving at 18.30 VHF 11 got the harbour staff who met us , handed over a key and gave the shower codes……Arbroath is also a local authority harbour working “office hours ” but with a weather eye on the tides. 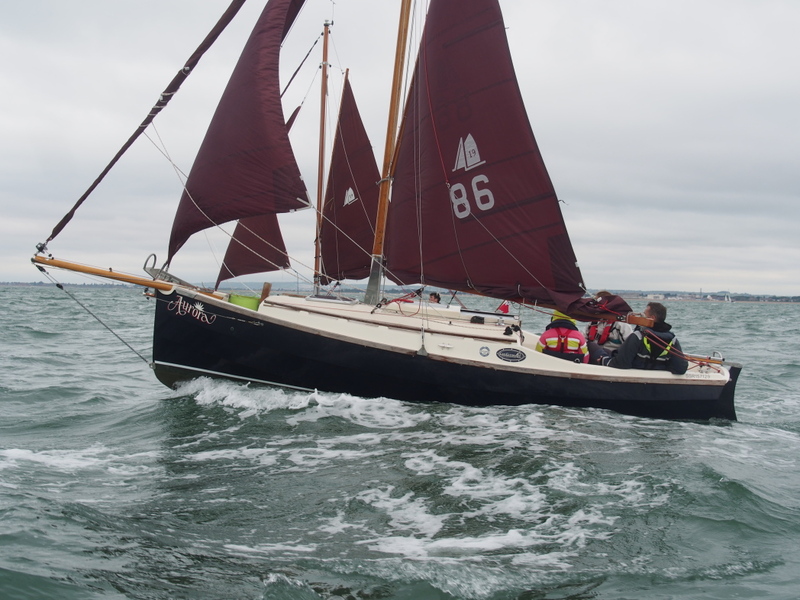 The forecast for 15th included F6 , and as the next leg to Stonehaven is 30 miles to a drying harbour and the leg to Peterhead a further 35 miles……with little in the way of “bailout” ports on the way we prepared to retire for 2014. I collected the car / trailer from Amble….3 hours train ..4 hours driving and talked to the HM re. slipways. 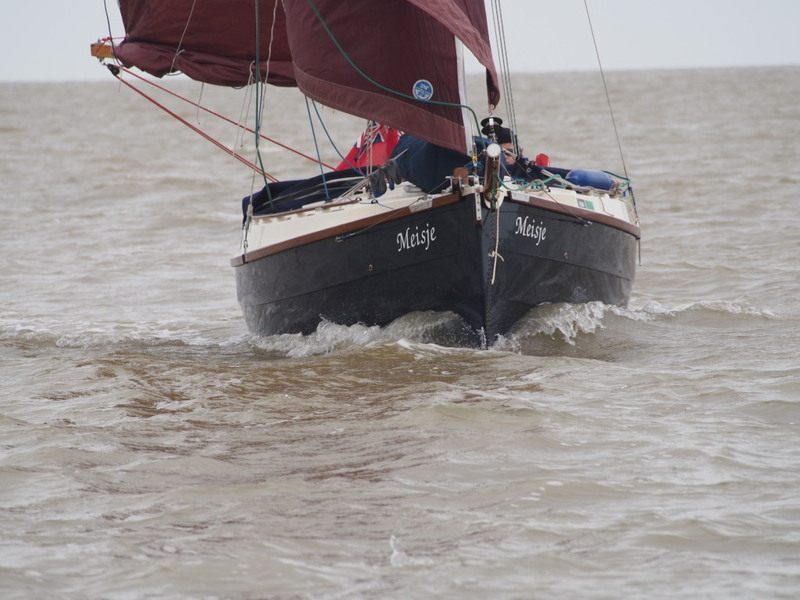 There is one …very shallow slope …..lots of debris …so we talked to Mackay Boatbuilders…..very helpful….who lifted us out at 08.00 on 16th..
Grantham to Stamford , and several miles around Biggleswade . We will resume next spring , all being well , and after a couple of weeks to tidy up , I think a spell on the East Coast.